Those of you who are dedicated blog readers (all three of you!) know the struggles we've had with the pacifier. Addi is over two years old and still thinks she needs a paci at least once a day - before Sam was born she was totally done with it but now she just takes her sister's. A few weeks back Addi used Sam's paci so often that her lips were literally bleeding. We gave serious thought to just getting rid of all paci's in order to break her of the habit - after all, Sam isn't really addicted yet, in fact she sometimes doesn't even want it. We've gone back and forth on the issue.... should we break her now and make her learn to self-soothe, or risk another paci-addiction in a few years? I was learning towards weaning her, even stopped picking them up on my routine trips to Target in hopes that we'd soon be over the need for them. That I would WISH for a paci addiction. 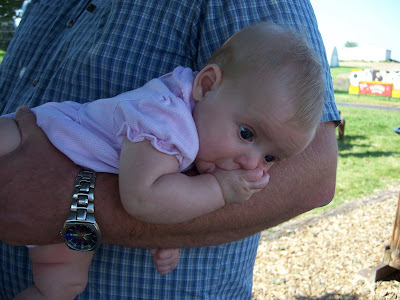 Sam's a thumb sucker now. And I'm pretty sure we can't cut the top off of her thumb and convince her to throw it in the trash like we did Addi's paci. I guess when your sister steals your favorite soothie 10,000 times you gotta learn to improvise. Super smart Sam. And I'm headed to the store to buy 100 more paci's. We have two thumb-suckers living in this house. After Caroline turned out to be such an addict, I tried HARD to get Charlotte to go for the paci for the same reason you mentioned - it can be taken away. But, no go. We've just resigned ourselves to orthodontia bills out the ying-yang. What can you do?